and our theme is Masculine/Men/Boys! 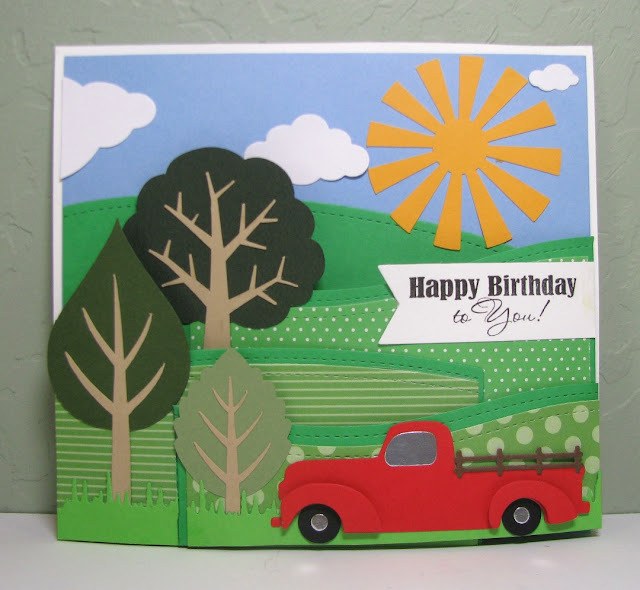 Dies: truck (Impression Obsession), clouds (Impression Obsession), grass (Frantic Stamper), hills (Frantic Stamper Stitched Scene Builders, or these), banner (My Favorite Things), trees, sun (Cricut). Paper: solid greens, sky (Michaels), big dotted, striped cardstock (Coordination Brights), trees, clouds, truck, clouds (scrap stash). Stamp: sentiment (Stampendous Birthday Assortment). I love the way it sets up and doesn't fall down, and I put the white backing on so I can write a note to the recipient. Trucks at Dies R Us!